Meadowsweet is now most commonly used against aches and pains, but there are other beneficial medicinal uses of this plant, as well. Meadowsweet, a woodland herb native to Europe and Asia, can now be found in various places on the North American continent. It is well-liked by herbalists for its flexible medicinal applications, and has in fact been recognized in the last couple of centuries as a safer alternative to aspirin made from willow bark. Soothing pain. Meadowsweet is similar to aspirin, and it can be used to relieve pain such as headaches. Relieving diarrhea. Unlike aspirin, meadowsweet is not an irritant to the stomach and can even help improve stomach ailments like diarrhea. Additionally, meadowsweet can also be useful for reducing acidity in the stomach as well as other parts of the body, helping acid-related conditions such as heartburn, ulcers, gout, and rheumatism. Meadowsweet's ability to relieve pain comes from its salicylic acid and salicylates. Salicylic acid is the anti-inflammatory compound that gives meadowsweet its ability to soothe pain, and it is also the main active compound in aspirin. However, meadowsweet has an advantage over aspirin because of the tannins found in meadowsweet. These tannins interact with the salicylates to protect the stomach and intestines, which can soothe intestinal upset; aspirin, on the other hand, has no tannins and can irritate the stomach. Meadowsweet is thought to be safe taken in appropriate doses. However, in some people, meadowsweet may cause nausea, skin rashes, and possibly even lung tightness. If taken in large amounts or for an extended period, it may cause more serious side effects such as kidney problems. Because meadowsweet is so similar to aspirin, it can cause a medical interaction if taken with aspirin or other pain medications, including other anti-inflammatories or even narcotics. Meadowsweet may also worsen asthma, and should be avoided by those who suffer from it. 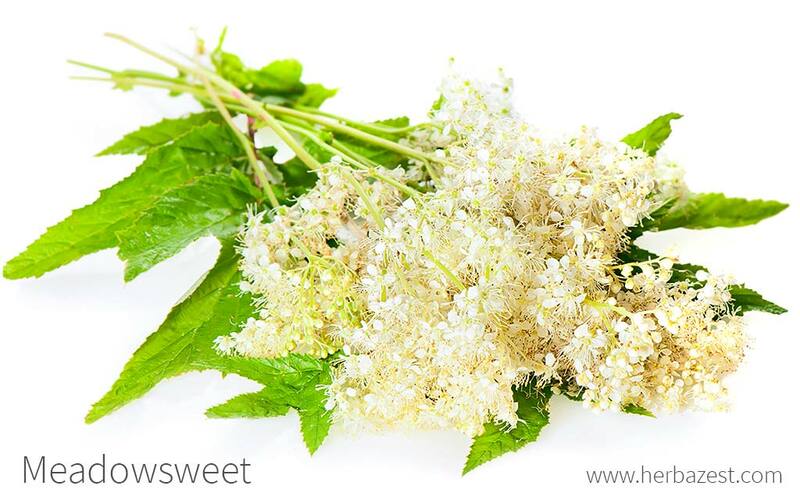 Those that have an allergy to aspirin should avoid meadowsweet as well, as they may be allergic to the herb as well, as should pregnant and breastfeeding women. While meadowsweet may be used in culinary preparations, it is far more commonly valued for its medicinal preparations. Meadowsweet is not a common ingredient in many dishes, but it does have a history of being used as a flavoring for beers, wines, and syrups. The flowers are also used in jams and other fruit preserves for their subtle almond flavor. The leaves can be used in salads, though this is not common. Infusion. To make tea from meadowsweet, steep one teaspoon of the dried plant in a mugful of boiling water for five minutes. This is an ideal preparation for soothing pain or indigestion, but it can help with joint ailments as well. Decoction. Boiling two tablespoons of meadowsweet in one cup (235 mL) of water creates a decoction that can be taken once a day for stomach ailments or aches and pains. Juice. Up to one tablespoon of juice can be taken per day, although it is advisable to mix the juice with water or another liquid before taking. Juice is especially useful for treating intestinal upset. Powder. Approximately one-fourth to one-half tablespoon of powder should be taken per day to improve joint pain or stomach ulcers. Tincture. Tinctures can be taken internally to help indigestion, but they can also be applied externally to relieve joint pain. Capsules. Meadowsweet capsules are most helpful for joint pain, and up to three capsules may be taken per day. Meadowsweet seeds or the fresh plant can be purchased from most garden centers. It is also possible to buy the dried parts of meadowsweet in specialized herbal stores and through online retailers. Tintures and capsules made of meadowsweet can be found in specialized health stores; however, online retailers often stock a wider variety of brands and concentrations. Meadowsweet is a popular plant to grow in gardens for its sweet aroma and ornamental appearance, as well as its ability to attract butterflies and other important pollinators. It requires some care, but is largely an easy plant to grow if planted in the right types of conditions. Meadowsweet may be propagated by either cuttings or seeds; both appear to be equally successful. The plant should be grown in fertile, moist soil. Adequate moisture is highly important, so especially water-retentive soils, such as clay or moss, are ideal. Soil should be acidic to slightly acidic, with a pH of 5.6 - 6.5, for the best growth conditions for meadowsweet. Meadowsweet can grow in full to partial sun, but partial shade may be helpful for keeping soil moist around the plant. Compost or mulch may also help to retain moisture while also providing the growing plant with necessary nutrients. It will bloom from June through August, and the best time to harvest leaves and flowers is while the plant is in bloom. Leaves may be pruned if they appear tattered, but flowers should not be deadheaded as it does not help the plant's production of new flowers. In favorable environments, care should be taken to prevent it from spreading due to its tendency to become invasive. Meadowsweet is not susceptible to many diseases, but may be affected by mildew, rust, or leaf spot. Meadowsweet is a perennial plant that tends to grow in damp meadows or woodlands. It has a reddish stem that grows serrated leaves with three to five lobes each. The shrub will normally grow to about four to five feet (1.2 - 1.5 m) tall. The fragrant meadowsweet flowers grow in the summer months and can be yellowish-white or red in color. These produce meadowsweet seeds, and the plant seeds itself freely in the wild but can also be cultivated through the root division method. Meadowsweet has several other colloquial names, and it may also be called queen of the meadow, lady of the meadow, maid of the mead, bridewort, or sweet hay. Meadowsweet or Filipendula ulmaria, is a member of the Rosaceae family. It was previously categorized in the genus Spiraea, but is now agreed to belong to the genus Filipendula. Over 4,800 other species are a part of the Rosaceae family along with meadowsweet, including several edible fruits - such as apples, cherries, and raspberries - and almonds. Several other plants are commonly referred to as meadowsweet, although none possess the same health benefits as F. ulmaria. These species include Japanese meadowsweet (Spiraea japonica), Iberian spirea (S. hypericifolia), and bridalwreath spirea (S. prunifolia). Meadowsweet has a long history of human use. It has been found on the sites of graves that date back to the Bronze Age in the United Kingdom, and evidence suggests that it was in use by the ancient Celtic communities as a medicinal herb. During the 14th century, it was referenced in Chaucer's Canterbury Tales as an ingredient in a drink, but nothing suggests that it was in use as an herbal remedy at that point in time. It was not until the 19th century that researchers discovered meadowsweet had high levels of salicylic acid and began to synthesize what would eventually become aspirin. Meadowsweet is most commonly marketed and sold as an alternative to aspirin, but this use is not widespread enough to make meadowsweet an economically important plant. Because its cultivation has little economic value, there is a lack of economic data about the herb. Although evidence is scarce, historians believe that meadowsweet may have been a sacred herb to the druids, as it may have been used in rituals and ceremonies, in addition to being used as an herbal remedy. In Celtic and specifically Welsh mythology, there is the story of a woman named Blodeuwedd, who was made out of flowers - meadowsweet, among others - and brought to life by a god to marry his nephew. She was later turned into an owl for infidelity. Meadowsweet was also commonly used in weddings, both as flowers to be thrown in the church and to be used in bridal bouquets and wreaths. Aromatherapy. Meadowsweet is commonly used as an ingredient in potpourri and other fragrances due to the strong, almond-like scent of its flowers. Dye. The root can also be used to produce a black dye, but it is not produced commercially. Gardening. The pretty and fragrant flowers of meadowsweet make of this plant a popular choice among home gardeners. Meadowsweet is not only a beautiful ornamental but also a medicinal plant, with several healing properties that make it especially valuable for fighting inflammations and soothing gastrointestinal problems.